A battered copy of Chez Panisse Desserts by Lindsey Remolif Shere sits on the bookshelf. That instant connection over a shared love of a book bodes well for my visit. My own, admittedly less-well used, copy has survived house-moves and floods. The pages of my copy have tell-tale marks of sticky kitchen adventures into the mysteries of curds and crepes , sherbets and soufflés. The copy on this shelf bears the traces of more serious professional study. I wrote about Kitty Travers a couple of years ago focusing on her influential ice cream making course at The School of Artisan Food. Since then, despite the fact I buy ice cream from La Grotta Ices almost weekly, I've simply tweeted my addiction. In the time following my course, Kitty Travers has been featured in more influential publications than mine, but I have the advantage, I think. 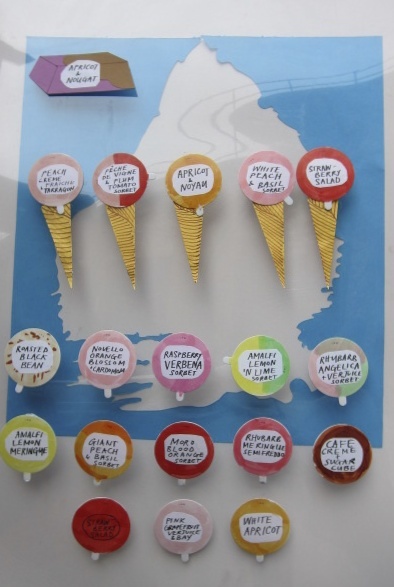 None of the writers can have given the ices quite such a thorough sampling! So, in the interests of further research, I accepted an invitation - maybe with a tad too much alacrity - to visit the ice cream 'shed' of my dreams. My friend, the hugely talented food illustrator Anna Koska joined me (examples of her work can be found at Anna Koska Illustration). Aprons and hairnets donned, hands scrubbed and hygiene instruction received, we pitched in. Four companionable hours of chopping and stirring, questioning and story swapping disappeared in the blink of an eye. It was easy to see why Kitty finds this such a satisfying and rewarding way to spend her day. Then it seemed only fair to leave her to get on with the real work. We felt very privileged to get our hands on such quality seasonal ingredients under such expert guidance. Right now the fruits include peaches, nectarines, figs, autumn raspberries, blackberries and plums. What's so special about La Grotta Ices, and why do I keep returning? I'm really not into the sweet slipperyness of most ice creams. What I do appreciate are top quality ingredients with a high fruit/low added sugar content. I want vibrant, imaginative flavour combinations (that's imaginative, not wacky) for my ice creams, parfaits, sorbets and granitas. So how about Blackberry & Violet; Melon & Jasmine; Gooseberry & Almond Nougat; Pink Grapefruit, Verjus & Bay; Peche de Vigne & Tomato; Chocolate, Mollases & Black Fig; or naturally sugar-free Apricot & Chamomile? Some scary sounding combinations in that list. In the right hands, it's an ice cream revolution and I'm very happy to be onboard. Kitty has travelled profesionally from pastry kitchens to ice cream parlours, from London to New York via Nice and Rome. After nearly four years in the kitchen of St John Bread & Wine, her life in ices began to take shape, initially out of a desire to recreate memories of her travels. Starting out by selling at London Farmers Markets and pitching up outside Neal's Yard Dairy in her tiny Piaggio Van, she now sells most Saturdays from her 'hole in the wall' outlet at Spa Terminus in Bermondsey. You might also be lucky enough to find her at various Fairs around London (Frieze Art is one that's coming up soon). La Grotta Ices is about more than making ice cream. Kitty Travers is an ice cream maker who wants to "create memories" via the medium of ice cream. Well she certainly succeeded in re-creating one for Anna Koska this week. It took just a spoonful of Raspberry & Fig Leaf ice to evoke a powerful sense of brushing past the fig tree in her beloved Sussex garden.